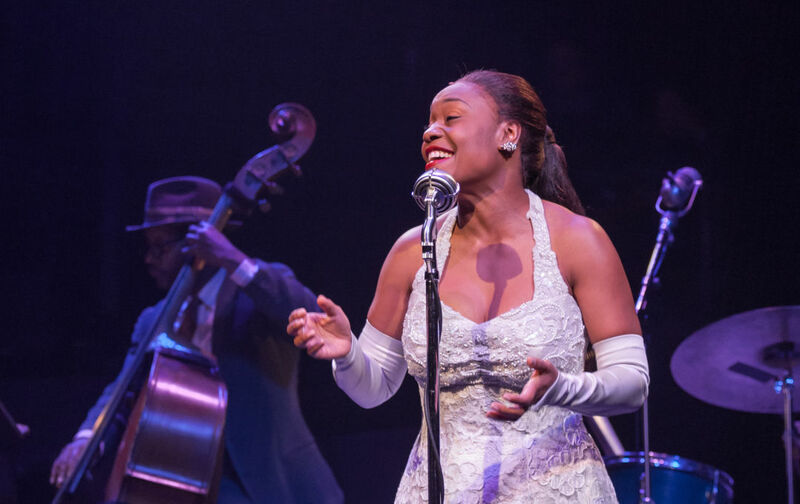 Deidre Henry’s portrayal of Billie Holiday has been described as “SUBLIME” and “GLORIOUS.” In this interview, Deidrie talks about the challenges of taking on the iconic role in "Lady Day at Emerson’s Bar and Grill". Pictured: Deidrie Henry as Billie Holiday with Tyrone Wheeler (bassist) in Lady Day at Emerson's Bar and Grill at Actors Theatre, 2017. You first performed the role of Billie Holiday in Lady Day at Emerson’s Bar and Grill for Actors Theatre in Louisville. What are the challenges in taking on a role based on such an iconic artist? It was such a thrill to perform at Actors Theatre of Louisville and I’m even more excited to be back at The Armory. The challenge of taking on any role for me is, “Where does this person sit in my perspective? What causes them to be who they are? What choices do they make in reaction to the given situation or circumstance they happen to be in?” With a fictional character, you have the luxury of making up a whole history for that character. But when you’re given a force of nature like Billie Holiday, and you’ve done the research to learn about her life, it can be a blessing and a curse. Her life is so filled with abuse, struggle and tragedy. She is so very much everything! So big, and so blatantly, honestly and achingly vulnerable. What she thinks and feels is so deep and also right on the surface. She is accessible and explosive. Playing her, it can be hard to be all of those things on any given night. So, I try to hit as many facets as I can, and still try to have her walk out with her dignity, because I believe that most people try desperately to own that part of themselves, no matter how flawed. How did you prepare to play Billie Holiday? I initially prepared for Billie by listening and immersing myself in her music. In order to thread the play’s story together emotionally, I created a playlist with the songs in the same order as in the show. To get a sense of how she was impacted by her environment, I read and watched everything I could get my hands on that spoke to who she was, who were her compatriots, what were her politics, what was happening, not only in the country and in the world, but in the jazz community. Finally, I settled down to learn 34 pages of dialogue. 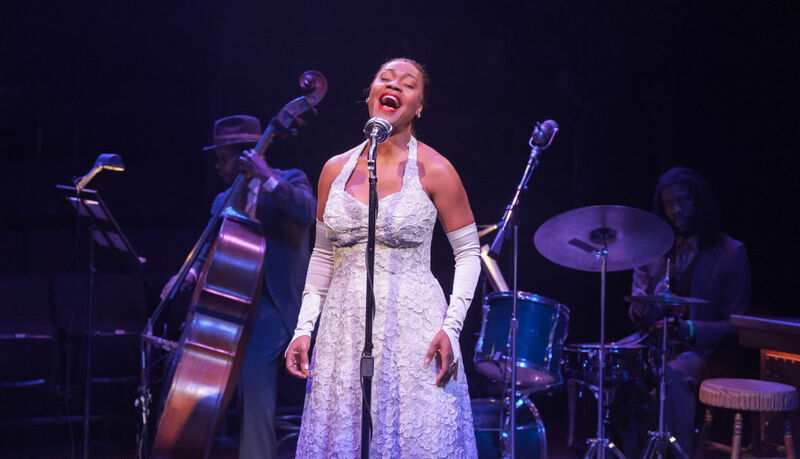 Pictured: Deidrie Henry as Billie Holiday with Tyrone Wheeler (bassist) and Chris King (drummer) in Lady Day at Emerson's Bar and Grill at Actors Theatre of Louisville, 2017. Billie Holiday once said: “If I’m going to sing like someone else, than I don’t need to sing at all.” How have you approached performing the music in this show? How does the audience impact your performance? The audience interaction is such an essential part of the play. What I came to learn about Billie was that she didn’t need to “come” to her audience. She didn’t need to “please” them. She showed up when she showed up, with everything she brought with her, and you came to her. It’s not that she didn’t need the audience, but she didn’t feel the need to take care of them or to make them comfortable. That was and still is a challenge for me — I care about my audience. I want them to feel comfortable. I want their approval. Billie didn’t. 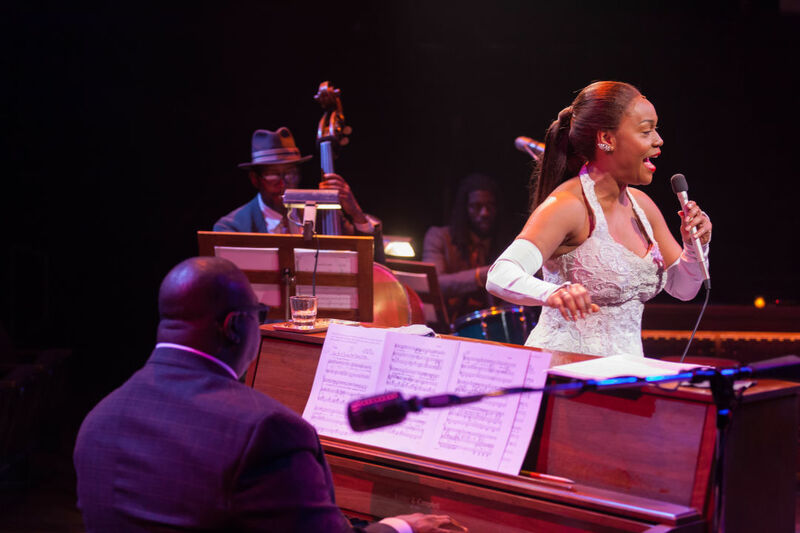 Pictured: Music Director Abdul Hamid Royal as Jimmie Powers and Deidrie Henry as Billie Holiday with Tyrone Wheeler (bassist) and Chris King (drummer) in Lady Day at Emerson's Bar and Grill at Actors Theatre of Louisville, 2017. Do you have a favorite moment in the show? There are a few moments that I just love, but I’d have to say that my favorite is when she’s talking about Bessie Smith and sings “Gimme a Pigfoot” into “Baby Doll”. There is a freedom and a wicked, carefree spirit woven into that section. You’ve known the director, Bill Fennelly, for a long time and have worked with him on a number of projects. How would you describe your collaboration process? Bill was my roommate in New York and he directed my first cabaret show, What a Day for a Daydream, which was a huge hit and an award winner. We’ve been each other’s champion throughout these many years. It’s not often, as an actor, that you get to be in a room with a director who has known you from almost the beginning of your career, and who has seen you through almost every twist, turn, high and low that this business takes you through. This collaboration is BLISS!!! The freedom to be bad and to fail, to struggle and be vulnerable, and to be given the room to explore, is a gift that Bill has given me in this process. I trust him implicitly with every part of my being. I don’t think I’ve ever had as much fun in a rehearsal process. To Purchase: Tickets start at $25.